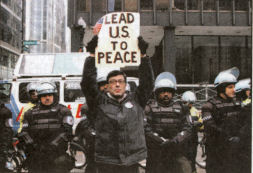 On November 3, 2006, anti-war protester and Chicago art-rock videographer/archivist Malachi Ritscher self-immolated as a demonstration of opposition to the American wars. Near a sign that said, “Thou Shalt Not Kill--As Ye Sow So Shall Ye Reap,” and in front of a steel sculpture called “The Flame of Millenium,” Malachi, draped in an American flag, set himself on fire while his camera filmed his death. His actions received relatively little media coverage, despite (or because of) the poignant immensity of their meaning.